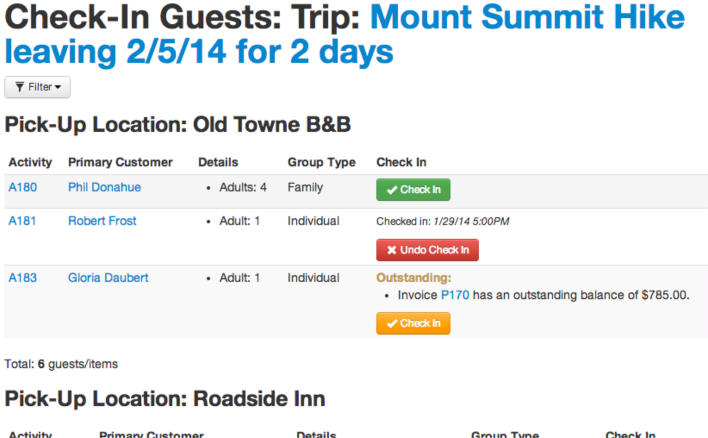 We recently launched a new feature for tracking guest arrivals, whether they have a rental or a reservation. For outfitters with many simultaneous activities or large groups arriving, the check-in view provides a clear and concise location to see all upcoming activities, review status information and record when guests arrive. The system is well suited to both tablets and computers. Each open copy of the check-in report stays synchronized, so if a group checks in with one employee, all other employees will be able to see that the group has arrived and is ready. This enables staff to establish multiple check-in “counters” within the office or at the put-in location. Each staff member can keep tabs on who has arrived and when trips are ready to launch by monitoring when all reservations have been marked as checked in. In addition to providing a streamlined tool to track arrivals and begin trips or rentals, the check-in view highlights important notes for activities as well, such as missing waivers or any outstanding balance. This way, during the check-in process, staff members can collect any missing requirements and information from guests before the trip begins. And the whole setup is highly customizable, as with many features in Arctic. The check-in view can include custom columns, activity notes and even be broken down by activity information, such as pickup location. Overall, we hope this new tool will simplify guest arrival for busy day-trip outfitters and rental operations, making it easier to quickly check in guests and ensure that all information has been received and processed for each guest. If you want to enable the check-in view on your installation, contact support. We launched Arctic Reservations version 2 a little over six months ago, and it’s been an amazing six months. We were thrilled to welcome a number of new outfitters into the Arctic community at launch time, and they eagerly took to the new version. With their feedback and support, we refined and polished the software. Version 2 was our chance to reflect on the first seven years of Arctic and redesign the product from the ground up to be more flexible, more powerful and easier to use. For guests, version 2 introduced a fully redesigned checkout process for online bookings that has greatly increased conversions by further simplify the online shopping experience. In addition, we tried to create a more versatile platform so we could quickly adapt to new needs and implement new features. These features just scratch the surface of what is possible in version 2. Currently, we are testing new features and will be rolling out many new ideas over the coming months. And we look forward to helping more of our version 1 customers transition to the new version during their off-season. Thank you to everyone who has helped make Arctic Reservations version 2 such a success. We can’t wait to share what’s next. Arctic Reservations started with a product for guests to exchange photos following their trip. Capturing and sharing photos of the beautiful and exhilarating moments of a trip allows guests to walk away with a tangible reminder of their experience. Today, we are returning to that original focus by adding a new product to the Arctic family. I am pleased to introduce the Arctic Photo Kiosk software. The existing photo sharing features built into our reservations have been tailored to multi-day tours, while our latest product aims to bring photography functionality to day-trip outfitters. The Arctic Photo Kiosk software is designed to monetize trip photography by offering a comprehensive solution for processing, organizing and presenting photos to guests. Throughout the day as guests go out on adventures, let your photo staff and/or guides capture magic moments. Feed these photos into the Arctic Photo Kiosk software, which will touch up, resize and group photos. When guests return from their adventure, they can browse photos either at on-site kiosks or once they return home through a special photo e-commerce website. They can select single photographs, or whole sets, to have digitally delivered, printed or burned to CD. The software will manage everything from initial upload of photos through order fulfillment, including offering comprehensive reporting and extensive customization. Our on-site hardware makes uploads blazing fast and can power touchscreen kiosks, where guests can browse photos as soon as they return from their adventure. Use HD television screens featuring teaser slideshows to get guests interested in their photographs. Arctic Photo Kiosks also has a powerful backend, capable of handling hundreds of thousands of photos. We put a lot of effort into creating a robust framework that will enable us to rapidly develop new features both for the photo software, and down the road, in new products. Arctic Photo Kiosks was initially deployed by a California-based outfitter in the spring, and we saw it’s success as hundreds of orders and thousands of photos were processed in the first months of their season. Today, we are excited to make the software publicly available. For more information, including features and access to a demo e-commerce page, head over to the new Arctic Photo Kiosk product page.